The 48th Cairo International Book Fair will open on Thursday, 26 January at the Fair Grounds in Nasr City, with 670 publishers from 35 countries. There will be 100 less Egyptian publishers than last year, reflecting the economic crisis that the industry is suffering from after the prices of printing material such as paper and ink doubled following Egypt’s floating of the currency last November. This year the fair has chosen the renowned Egyptian Poet Salah Abdel-Sabour (1931 – 1981), one of Egypt's most influential contemporary poets, as the fair's person of the year. Last year, Egyptian novelist, Gamal El-Ghitany (1945 – 2015), was chosen as the person of the year. Morocco has been chosen as this year's guest of honour, with the theme of the year being "Youth and the Culture of the Future." Many Arab intellectuals and poets will participate in this years cultural programme with the list including renowned Syrian poet Adonis, Bahraini poet Qassim Haddad, Tunisian philosophy professor Fathy El-Triki, Egyptian director Waheed Hamed, Chinese novelist Choi Tsi Chen and Egyptian intellectual Morad Wahba. However, this year will see a lower number of publishers. Last year saw a record number of participating publishers – 850 – and the largest number of countries participating in the fair since its inauguration. This year will only see 670 publishers, 451 Egyptian, 200 Arabs, 13 international, and six from African countries. The numbers last year amounted to 550 publishers from Egypt, 250 from the Arab world, and 50 foreign publishers. This year's fair comes amid rising prices of books due to the acute drop in the value of the Egyptian pound against the U.S. dollar after Egypt’s central bank floated the currency in November last year. 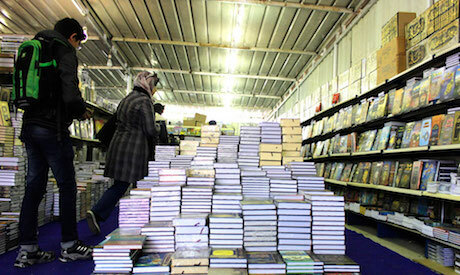 This doubled the price of most books as Egypt imports nearly two thirds of its needs of paper and ink from abroad. This also will make it hard for Egyptians to be able to purchase books from Arab publishers, due to the fact that all of it is priced in USD. For instance, a $10 book will be 180 EGP, which is almost 10% of the salary of an Egyptian worker or an employee who earns the minimum wage set EGP 1200. The head of the General Egyptian Book Organization -- the official organiser of the fair -- Haitham Al-Hajj Ali, vowed to crack down on publishers who violate copyrights and publish unauthorised books. The problem of unauthorised books has cost publishers who own the copyrights large losses as "fake books" are sold at lower prices than the original book published by the owner of the copyrights. In 2015, books by Sheikh Youssef El-Qaradawi, who is currently living in Qatar and is a strong supporter of the Muslim Brotherhood, sparked controversy and were removed from display at the Dar El-Shorouk wing of the fair, along with books by the late radical Islamist author Sayed Qutb. The fair will be open daily from 10am until 7pm for book selling, and until 9pm for cultural events. Tickets are sold in front of the fairgrounds for 1 EGP.